Quinta do Ameal is a small ancient property (1710) of rare natural beauty. Here are created and produced excellent white wines made from a Portuguese grape variety called Loureiro. This reaches its greatest aromatic and tasty expression at this incredible Lima Valley region where we are located. 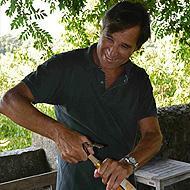 Since the beginning of the project, the ever-present spirit, was the creation and specialization in new and different wines made with this noble grape, and today we can clearly say that the Ameal bucked the Loureiro on a map of top wines production in Portugal, because our wines, are regularly considered by the most respected national and foreign critics, among the best white wines in the country.